In the field of safety and security rapid, accurate communication is essential. Euronova offers the ability to integrate different products in the range to ensure faster and better response to problems relating to the protection of art. For example, both GalleryMasterTM and GalleryMonitorTM systems will integrate with our Pager system to give alarm information to the gallery assistants and security staff within 1 second of an alert. Another option is to integrate these systems with indoor CCTV and specifically to activate preset camera positions which come up on the screen in the control room immediately. Personal attack buttons (wire-free) radio through to the SmartPatrolTM Control Box. This the office and in parallel the SmartPatrolTM forwards a message to a Pager (see below). The RS232 Output from GalleryMonitor / Master feeds into a CCTV matrix allowing flexible programming of Camera Presets. GalleryMonitor / Master control output relays which are hardwired into an intruder alarm system. A wire-free network of receivers and repeaters covers an outdoor sculpture park. Sculptures are protected with specially designed sensors, outdoor IR beams are used to protect the perimeter, staff are issued with PA buttons and art indoors is equipped with sensors. The receiving system is used in one mode during the day whilst open to the public and via the intruder alarm in a separate mode at night. To provide off-site support to a small museum, the GalleryMonitor systems (with pictures and PA sensors) also triggers a CCTV alarm. The pictures are then transmitted to an alarm monitoring centre (with CCTV capability) who can alert keyholders and other support staff / police. All triggerable by any Euronova Control System. (Also possible is Keyboard to send pager messages and serial transmitter can link to phone PABX). Power: Each unit requires 12v d.c. RelayPager uses 200uA on standby and 300mA on transmit. 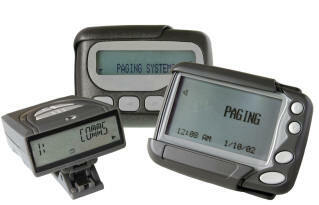 Serial Pager uses 500mA on transmit. Loudness: Variable tones and vibrate. Price: Starting from GBP600 + shipping + VAT, dependant on system. Never install antennas near or close to telephone, PA, data comms. or power cables.